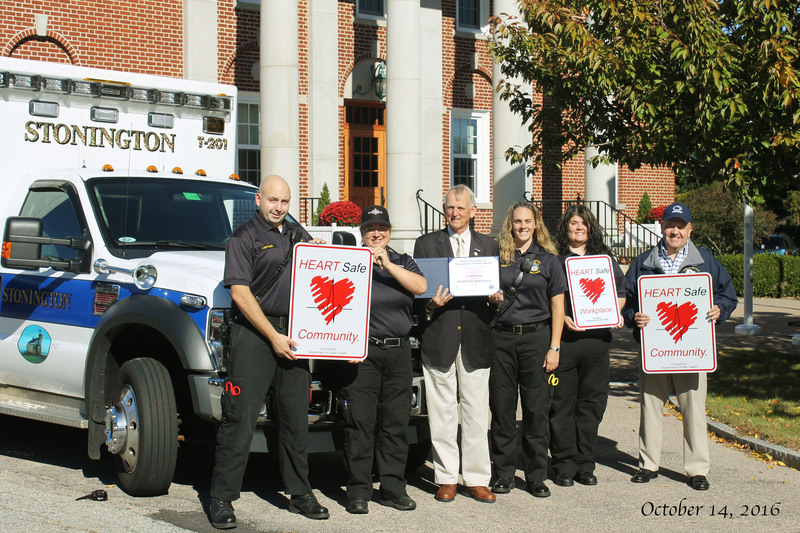 HEARTSafe Community – Stonington Volunteer Ambulance Corps, Inc.
Stonington Volunteer Ambulance Corps (SVAC) has made powerful strides in the last few months to improve the life-saving resources available to local residents. After months of preparation and training, SVAC is proud to announce it has obtained the designation of HEARTSafe Community for the Town of Stonington. After the establishment of SVAC’s CPR training site, numerous students have obtained American Heart Association (AHA) certifications in CPR, AED, and First-aid. Through this training, and identification of public-access AEDs (Automatic External Defibrillators), SVAC has obtained this three year designation for the town. With this same theme, our message today is: Early CPR saves lives. According the AHA, the brain begins to die between 4 to 6 minutes after cardiac arrest begins. In many cases, bystander CPR can mean the difference between life and death. There is no better time than now to learn CPR. Our hope is you never have to use your skill, but if a call to duty ever arises, we want you to be prepared. SVAC offers a wide-array of CPR/AED/First-aid courses at competitive prices. Group rates are available at a discount as well. Please use the contact information below to request a class. Consider taking your training further by joining SVAC as a volunteer! We are always looking for dedicated and hard-working members who are willing to sacrifice their time for the betterment of the community. As our call volume increases, we depend on our volunteers more every day. If you or anyone you may know is interested in working with SVAC, please don’t hesitate to reach out using the information below. You do not need to be an EMT to join. SVAC is happy to sponsor a dedicated student through an EMT class. We also have many social members who do not have patient interaction, but simply help with fundraising and other operational duties. Since 1923, SVAC has cared for the citizens and visitors of Stonington. Equipped with two ambulances and a quick response SUV, SVAC answers calls for service 24/7. As the EMS landscape continues to grow and improve, SVAC works tirelessly to provide the highest level of care. SVAC relies heavily on donations to operate at full capacity. Please consider donating to our volunteer organization. Any donations can be sent to the address below. ← CPR Training now available!